Aspetuck Land Trust was one of the first organizations of its kind formed in the State. Currently a network of over 100 land trusts, nearly one per town, is operating in Connecticut. As a local organization, we are keenly aware of our region's unique resources and are strongly committed to preserving them. By the early 1960s, the pressures on the towns of lower Fairfield County to develop their open parcels of land were mounting. Town plans of development and open space plans were being prepared to guide the planning and zoning commission with their decisions. But gaps in the guidelines were showing up. There was no legal protection of the tidal marshes along Connecticuts shores and up her rivers; and inland wetlands were thought of as boggy areas to be filled to make a level building site. Barlow Cutler-Wotton had just been elected president of the Westport League of Women Voters. Attendance at the Planning and Zoning Commission meetings was part of the Observer Corps of the League. And she was concerned to find an application had just been filed to construct a geriatric hospital on the corner of Wilton Road and Kings Highway North. The considerable salt marsh was part of the application. The Chairman of Planning and Zoning directed Mrs. Wotton to the lawyer whom he felt would be the most knowledgeable, Leonard A. Schine. It was from that first meeting with Leonard that Barlow learned a most valuable lesson to separate wishful thinking of wanting to save the salt marsh from development from the actual gathering of data that would build a case for the Planning and Zoning Commission. With no tidal wetlands act in place (that would come in 1969) traffic and congestion at the corner would be the cornerstone of the case. Mrs. Wotton successfully worked to save the salt marsh and in 1987, the salt marsh was given to the Aspetuck Land Trust by the new owners. Taylortown Salt Marsh, with its view down river, is an integral part of Westport's open space. At the end of her League presidency in 1965, Barlow ran for the Representative Town Meeting (RTM) to represent her District 2. With her research and urging, in 1966, Westport established a Conservation Commission. Barlow Wotton and William Turner, both future presidents of Aspetuck Land Trust, served on this committee. In those days, Land Trusts were just being formed around the state in order to support and cooperate with the Conservation and Planning and Zoning Commissions of their towns. 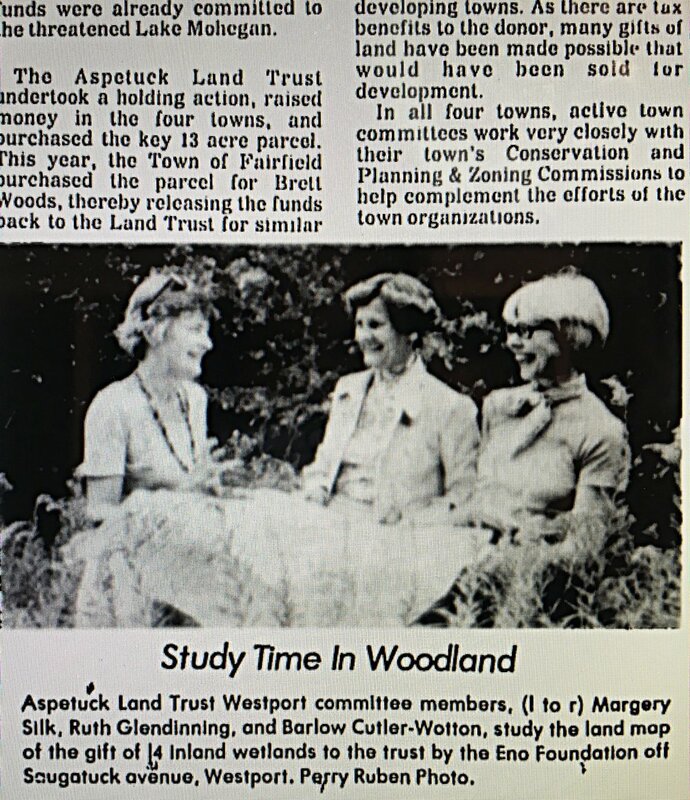 On Sunday, August 7, 1966, Barlow Wotton called a meeting in her studio to form a steering committee to set up a land trust for the towns of Westport and Weston, for the purpose of acquiring by gift or purchase lands to be preserved in their natural state as open space. According to the Westport News, Aug. 11, 1966. The scope of the Land Trust had also been expanded to include the four towns that the Aspetuck River traversed Easton, Fairfield, Weston and Westport - thus the name, Aspetuck Land Trust. Aspetuck Land Trust was formally organized at its first board meeting at the home of John Ripley Forbes. Elected as President was Mrs. Peter T. Wotton; Vice-President, John Ripley Forbes; Secretary, Mrs. David R. Williams; and Treasurer, Joseph Fahey, Jr., Senior VicePresident of State National Bank. Other members of the Board of Directors were Miss Madeline Moses and Miss Katharine Ordway of Weston, Leonard A. Schine, Harry W. Thompson, Joseph J. Thorndike and William Turner of Westport. Members to represent Easton and Fairfield were to be added. Quoted in the Westport News article of November 3, 1966: The purpose of the Aspetuck Land Trust is to promote, for the benefit of the general public, the preservation of natural resources - rivers, streams, tidal marshlands, inland wetlands (swamps, marshes, bogs), woodlands, ridge tops, rock ledges, stands of trees, other natural features and the plant and animal life thereon and the preservation of unique historic and scenic sites. Mrs. Wotton went on: At long last we have a private group that will be able to move quickly to save the fast disappearing rural beauty of our countryside. The first land gift of 20 acres was the Twin Bridges Nature Preserve, now called Leonard Schine Preserve. The headline in the local newspaper appeared only two weeks after the announcement of the organization meeting of the Trust. Glendinning Pledges Gift of 25-Acre Open Space to Aspetuck Land Trust (Town Crier, Nov. 17, 1966) A year later on October 5, 1967, the Town Crier also carried the headline, Aspetuck Trust Gets First Gift of Twenty Acres. A smiling Ralph Glendinning, president of Glendinning Companies, is handing the deed to Twin Bridges Nature Preserve as it was to be called (now Leonard Schine Preserve) to an equally smiling Mrs. Barlow Wotton. John Ripley Forbes, vicepresident of the Trust looks on. Aspetuck Land Trust held its first public meeting on Friday, March 31, inviting the public to attend and hear Richard Pough, chairman of the Open Space Action Committee, speak on The Individuals Role in Preserving the Beauty of Our Communities. This meeting was the organizations first membership drive. And from this meeting came the introduction to two future donors of their land, Miss Eva LeGallienne and Miss Alice DeLamar -LeGallienne Bird Sanctuary and Stonebridge Waterfowl Preserve. The Land Trust received its very vital classification from the IRS as a non-profit corporation in the Spring of 1967 so the Board of Directors voted to raise funds to buy the Lobdell property (now Brett Woods) in Fairfield. From those initial fundraising efforts, the ALT endowment was formed.